OXFORD, England (CNS) — Catholic leaders in Congo said they hope for lasting peace, after the bishops’ conference helped mediate a government-opposition accord. “We’re all saluting this great step, the fruit of a dialogue arranged by the church,” said Msgr. Leonard Santedi Kinkupu, rector of Kinshasa’s Catholic University and former of secretary-general of the bishops’ conference. “Being a Catholic country has given us an advantage over other African states when it comes to seeking peace, and it’s good the church and its bishops have been instrumental in bringing this about,” he told Catholic News Service Jan. 3, as talks opened on practical implementation of the Dec. 31 accord between opposition leaders and representatives of President Joseph Kabila. Msgr. Kinkupu told CNS that Congo’s feuding politicians had been unable to arrange their own talks and could be thankful for the “huge benefits” offered by Catholic mediators. In August, the bishops’ conference launched a mediation bid after opposition leaders accused Kabila of seeking to delay autumn elections, but the bishops withdrew from a national dialogue in October amid worsening violence. On Dec. 8, shortly before the Dec. 20 expiration of Kabila’s second and final term, both sides agreed to resume talks mediated by church officials. Under the Dec. 31 accord, which was witnessed by foreign diplomats, Kabila will remain in power pending elections by the end of 2017, alongside a government headed by an opposition-nominated prime minister. Kabila will comply with constitutional provisions barring him from seeking a third term. In March, a National Transition Council, headed by 84-year-old opposition leader Etienne Tshisekedi, will be established to monitor the electoral process. U.S. and Belgian authorities welcomed the accord and the bishops’ role in reaching it. Agence France-Presse reported Jan. 3 that agreement still had to be reached on composition of the new government and transitional council, as well as on dates for the 2017 elections. The agency added that several opposition groups had not yet signed the Dec. 31 accord and said there was also uncertainty over the fate of around 400 political prisoners. 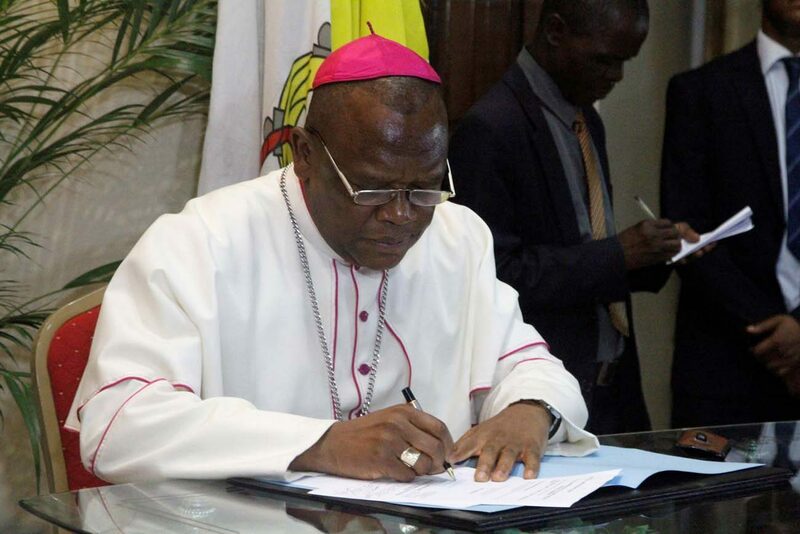 The bishops’ conference secretary-general, Msgr. Donatien Nshole Babula, who helped negotiate the accord, told journalists Jan. 3 the document was binding, pending agreement on “certain practical modalities,” and should be considered representative even without certain signatures. Catholics make up around half the 67.5 million inhabitants of the mineral-rich Congo, where up to 6 million people died in a series of 1996-2003 wars.